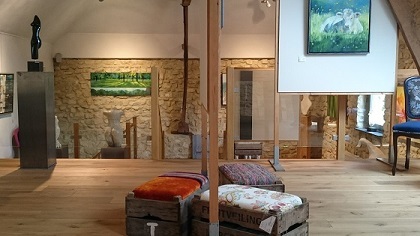 In my third blog post on ‘Art in Limburg’ I take you to a beautiful location in the midst of the ‘Heuvelland’ region: gallery ‘In de schuur’, owned by Helga and Anne van der Poel. On my way for my interview with Helga van der Poel, I pass the villages of Voerendaal and Ransdaal. The views are amazing! The lush Limburg countryside is an attraction in itself, and invites you to take a tour, by car, bike or on foot! Eventually I get to my destination: gallery ‘In de schuur’, in the small village of Wijlre. When I get out of my car, Helga is there to welcome me. I have been here before and praised gallery ‘In de schuur’ for being a hidden gem at the time. I still think it is! In what once used to be a farm shed, you now find a spacious, light and charming gallery. 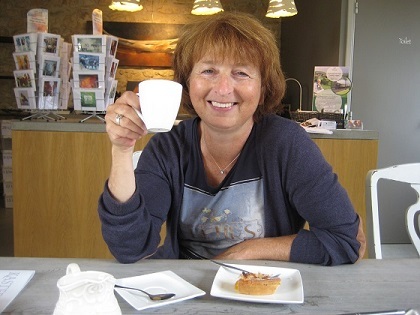 Helga invites me to sit down at her table and while enjoying fresh coffee with Limburg flan – I cheer for the Limburg hospitality ;-) – she shares her life story with me. Helga grew up in the Eifel, in Germany, where she spent lots of time in the forests surrounding the family house. She tells about her sweet childhood memories, when she lived so close to nature. She concludes: ‘Nature is my friend, or maybe vice versa, as nature can exist without mankind too’. Her bonding with nature is being expressed in Helga’s artwork: she loves painting landscapes and farm animals like cows, sheep and pigs. Also her ceramic and wooden objects are inspired by nature. Her creations are realistic, but at times also lightly surreal or abstract. 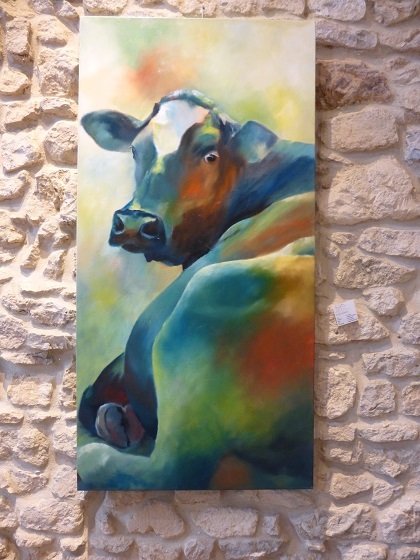 Helga likes using bright and warm colours in her paintings; you will find her cows and sheep reflected in a wide variety of colours. It occasionally happens that a work of art is based on the feeling that was aroused by a certain colour. The painting Vlieg met de Wind (literally: ‘fly with the wind’, see photo on top) is a beautiful example of such! Does this sense for shades of colours originate from the time that Helga was working as a professional florist? Or is it perhaps the other way around, and did she become a successful florist because of this gift? Anyway, Helga’s bonding with nature has certainly become apparent in her creations. Besides own work, gallery 'In de schuur’ exhibits work of other artists too. At the moment, amongst others, you will find glass work of Felix Wijnes and beautiful ceramics of Frans Thevis. For artist collectives it is also possible to hire the complete gallery and organise an exhibition to their personal view and taste. For example, in the weekend of 10 and 11 September 2016, an exhibition by different fine wood artists will take place. Helga's daughter, Anne van der Poel, is an upholstery craftswoman. Examples of her creations are shown in the gallery too. I was impressed to see her results renovating an antique piece of furniture and how she can even turn an old fruit crate into an original seat! And as different people like different things, Anne has got a range of fabrics to choose from; from classic to romantic to contemporary design, you can take your pick! Additionally Anne organises upholstery workshops. Helga van der Poel also has put effort in art projects in the region and beyond. Since 2011 she helps organising the 'Kunstroute Gulpen/Wittem', a tour you can take by car, following different – and often unique – exhibition spaces. 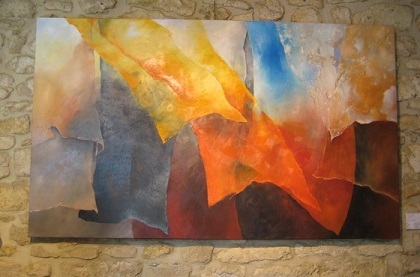 This art event is organised every two years during the Pentecost weekend and lasts three days. In cooperation with the Zuid-Limburg Tourist Board, Helga is also busy compiling a brochure containing information on galleries in the ‘Heuvelland’. Furthermore she participated in an international art project by Ed Hansen, called the Gogyoshi Art Project (GAP), to commemorate the nuclear disaster in Fukushima in Japan, with exhbitions in The Netherlands, Germany, Portugal, Spain, Macedonia, Brazil and South Korea. Besides her own gallery, you can also get to see Helga’s artwork at several exhibitions: at Gallery Global Art in Tongeren (Belgium) in August, at 'Kunst Offensive Wegberg' (Germany) end of August, and at the ‘Andreaskerk’ in Heerlen (The Netherlands) from November 2016 to February 2017. Visit the galleries’ website for opening times and contact information. 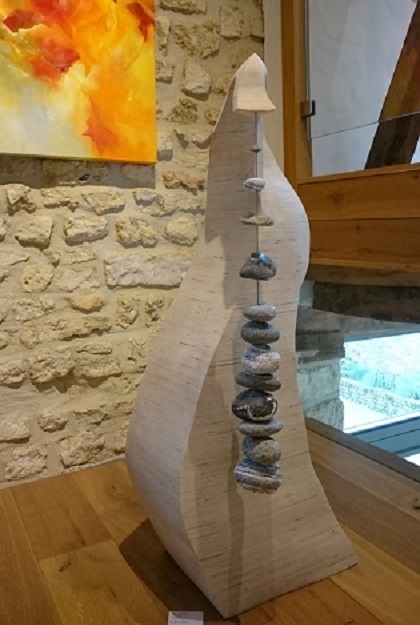 Enjoy the views of the Zuid-Limburg countryside on your way going there, immerse yourself in art, and before you set off ‘en route’ again, stop by for a lovely ice cream or afternoon tea at ice cream farm PAULS, which is situated only a stone’s throw away from gallery ‘In de schuur’. A great day out guaranteed!